The Legal Genealogist believes it 100%: there isn’t very much in genealogy that’s quite as much fun as a good juicy divorce. Divorce records often disclose details we can’t find elsewhere: things like the maiden names of the wives and relationships to children. That’s the kind of record set that makes any genealogist smile… and you won’t find it in any courthouse. Yep, I’m off in the local laws again, preparing for this weekend’s spring seminar of the Tacoma-Pierce County Genealogical Society in Tacoma (walk-ins are welcome Saturday — just sayin’ …) and this time looking at some real treasures in the statute books. Private laws are wonderful things for genealogical research. And they’re published in those volumes of laws passed every year by the legislature, federal and state, which means they’re usually digitized and online somewhere and can be found through some form of word search. Private laws cover a lot more than just divorces. 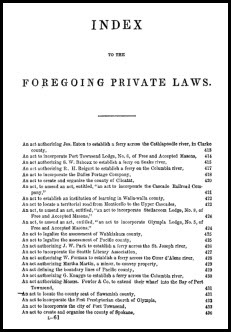 Any time somebody wanted to set up a ferry or a toll road or to build a bridge or to incorporate a college or a bank, and in so many cases where money needed to be appropriated, a private law was enacted. Spend some time with the statutes and session laws of any jurisdiction where your people lived. You just may find them — and that elusive maiden name or proof that that child really was the child of that person — in the private laws of the time and place. Did these sorts of private law divorces occur in all US states/territories? Not in all states and not in all time periods. Even some states where divorces were done by the legislature at first were switched over to the courts later. For example, early Tennessee divorces were by the legislature but by 1834 were in the courts; in NJ, the switchover to the courts was in 1844. So most states have “private” laws? Would I look in some states or counties under private laws? I have found some interesting stuff under Chancery Records. Since my various ancestors were anything BUT a copy of Ozzie and Harriet Nelson, I have had to do a lot of investigating. Yes, as far as I know every state has (and has had) private laws. These are in the state legislative records, usually in the State Archives. Thanks Judy! Another great source I didn’t know about. Public laws can also contain names. Laws for layout of roads, a courthouse, layout of election districts, county boundaries, setup of a ferry, or just about any transfer of private land to a public use. Some of the laws you’re listing here (layout of road, courthouse, election districts, set-up of a ferry) are often not considered public laws at all, but rather local laws (a distinct category). I know them well and have used them extensively. Even gave talks!